EL SUNZAL, El Salvador—I’ve been mostly ignoring my phone for almost a week. I didn’t bother to upgrade my data and made sure to turn off news headlines notifications, but while weaving in and out of Wi-Fi, I’ve posted some impressive pictures from El Salvador. With breathtaking landscapes, picturesque architecture, and a robust and colorful art scene, this is a visual traveler’s dream. When I finally check my messages, queries abound: “What’s in El Salvador?” I glance at the map spread out on the floor, a playful habit that makes me feel like an explorer of old, and admire the country’s long coastline and mountain-laden interior, mountains I could see from the capital city of San Salvador. I recall the archaeological ruins I visited and the warmth of the people. Spanish is the main language spoken, but many Salvadorans also speak English. 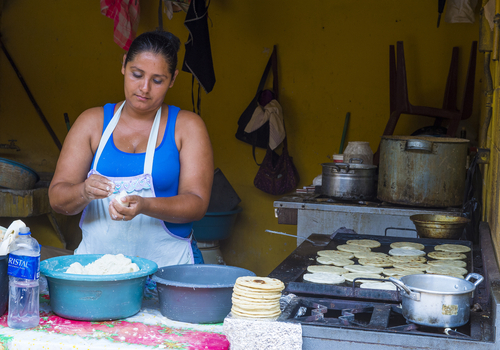 Though my Spanish is rusty, no language barrier could keep the pupusa-making ladies from showing me, step by step, how they prepare this unofficial national dish of thick corn tortillas stuffed with savory fillings, and inviting me to take photos before serving them up with wide, proud smiles. The authenticity of happy people, proud enough to enthusiastically share their joyful connection to their culture, is what made El Salvador so special. Human warmth and interaction elevate a breathtaking place to an unforgettable one. “What’s in El Salvador?” Only everything I want in a destination. I’ve seen many majestic views; it’s how a place makes me feel that tips the scale. Because El Salvador’s tropical climate hardly fluctuates through the year, the time to visit is now. The “dry” season is November until April, and during these months, the mountainous regions aren’t as lush and green as during the wet season. The word “wet” is a bit misleading, as typically just a daily afternoon shower can be expected, but do have a rain-jacket handy. The coastal region is simply warm and humid, and serves as one of the world’s top surfing destinations year-round. In the centrally located capital city, observe a diverse range of architecture and immerse yourself in culture. The Spanish conquered the region in the early 16th century, and while Spanish architecture was abundant, many of the colonial structures, including cathedrals, were destroyed by a series of earthquakes. Modern and gothic-style cathedrals have taken their place. Off the city’s main plaza, Plaza La Libertad, I was awestruck inside of Iglesia Rosario, a church built in the 1970s with an intricate interior stained-glass system that interacts with the shifting sunlight over the course of the day. The National Museum of Anthropology houses Mayan and Olmec (pre-Mayan) statues and relics, while the National Museum of Art showcases Salvadoran art from the mid-19th century to the present. Since you’ve been eyeballing the green-tipped mountain peaks from a distance all day, you may as well make plans to head there, but while en route, stop at the Joya de Cerén, the “Pompeii of the Americas.” The UNESCO archaeological site, showcasing everyday life of the Mayan people, was buried under an eruption around 600 A.D.
Inland El Salvador, with 25 volcanoes and 14 lakes, is a wonderland of geological formation. Even adventure novices can enjoy my favorite jaunt, Cerro Verde National Park, where a picturesque hike up Ilamatepec, the country’s tallest volcano, passes an array of vegetation, hummingbirds, and orchids. The peak, 7,800 feet above sea level (not high enough for altitude sickness), rises over a bubbling blue-green sulfur lagoon and offers what is arguably the best view in all of Central America: nearby Izalco volcano and Lake Coatepeque, a beautiful sparkling crater lake you can later explore by scuba diving if so inclined. If the day is clear, you’ll see all the way to the highlands at the Honduran and Guatemalan borders, where Montecristo National Park offers enchanting hikes through forests frequented by toucans, pumas, and spider monkeys. In Apacena, rent a buggy and ride up the mountain to Laguna Verde Crater Lake. There are lush mountains everywhere—you decide how to scale them. 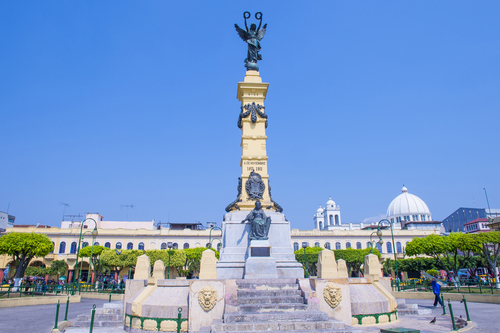 Located 31 miles northeast of San Salvador is the cultural capital of the country. Suchitoto, or “Suchi,” with its colonial houses, churches, and art galleries, is also a great place to learn about indigo, the natural colorant derived from the xiquilite plant, and use indigo as the Maya people did in a workshop at Arte Añil. When I asked Irma, an indigo artisan and Arte Añil’s proprietor, about chaparro, the traditional Salvadoran sugar cane spirit, she opened a bottle and enjoyed a drink with me. That hospitality will stay with me always. Suchitoto’s shops showcase the wonder of local artisans’ traditional crafts, specializing in clay, woodwork, and the local painting style. Nearby Lake Suchitlán, a former river that was dammed, has a lush ecosystem teeming with pelicans, herons, and storks. I immortalized with both photos and video the sight of morning mist dissipating from the lake while the animals noisily partook in morning rituals. The same symphony of flora and fauna is commonly portrayed in the paintings local artisans sell. With year-round sun and two of the world’s best-known surfing spots, El Sunzal and Punta Roca, the 186-mile coast is where most of the tourists are, evidenced by more upscale hotels and restaurants. In La Libertad, I walked the fishermen’s pier, witnessing the catch-of-the-day transfer from boat to merchant. You’re not limited to surfing fantastic swells; reefs offer diving and snorkeling, gold- and black-sand beaches are great for swimming, and there’s always someone willing to take you out for a sail. When I get some more money, I might buy a place west of La Libertad near the El Tunco beach area, where I hung my hat last night. I already feel welcomed and at home here. Where else can I surf world-class waves, climb volcanoes, and scuba at altitude, all on the same day? The writer was a guest of Epic Tours El Salvador. Travel can be complicated, but it’s not the case here, as most major U.S. cities fly direct to SAL, El Salvador’s international airport, situated just 30 miles outside the nation’s capital. The tourist card is only $10, no visa required (but don’t forget your passport), and the currency is the U.S. dollar. Travel within the country is simple, as the highways are modern and public transport accessible, but I’d suggest a data upgrade on your cell phone if renting your own vehicle. The winding mountain roads can be tough to navigate. El Salvador’s national beer, Cerveza Pilsener is a pale lager. The brew, dating back to 1903, is a primary sponsor of El Salvador’s soccer team, which plays in Central America’s largest stadium, San Salvador’s Cuscatlán Stadium. The beer’s aroma has grass and grain, and the taste starts sweet but finishes, abruptly, bitter. Served ice-cold, it’s a perfect warm-weather beer. GOAL! Tourists in the know return year after year to enjoy the warm Gulf waters, the sunshine, and the beauty of nature.